fosters release from moral conditioning. and the sun of nondual truth dawns in the field of reality. exalted above all progressive approaches." it is essential not to fall prey to this demonic view." seeker242 wrote: I have never heard of ANY zen tradition teaching that zen masters are enlightened super beings. So why do some people view them as super beings when it's not an actual zen teaching? What is the source of that belief? It seems to me that the source is not any zen teaching but rather the ignorant mind of practitioners. So the ignorant mind of practitioners is really the problem. And that's what the legend tells us. Buddha approved Kasyapa, Kasyapa approved Ananda, etc. And all the students wait for the approval of their teacher that they actually got it right. That is the power of the teacher, that is spiritual authority. And just like any power, it can and it will be abused. Add to this the idea that people can learn Zen ONLY from teachers within a lineage. This is again enforcing the position of Zen teachers. Astus, it sounds like you have a lot of frustration and anger, and misunderstanding as to what the purpose of Dharma Transmission is. The main point of it, is simply to certify that the Zen teacher knows what they are talking about. Similar to a College Professor having a PHD degree. It doesn't mean that they are saints or OCD perfect beings who do not ever make mistakes. A kensho experience, is a direct experience of the Eternal. But a person can still slip up in their training, even after they've had one. I've had a direct experience of the Eternal/That Which Is, and I've certainly made my share of big mistakes since having one. And I've received the consequences for those mistakes. The risk is less for monks,(that they will make serious mistakes, not whether or not they get the consequences for mistakes, we ALL get the consequences for our actions) because they are in a monastic environment, so everything there is set up to aid training, along with living with other monks who can help one stay on-center, but it can still happen. Dharma Transmission does not mean one has achieved "Buddhahood" it means they have had a kensho, (because having one is nessicary to understand the Dharma to teach it) and, it means they have undergone years of training, and education in Dharma and Dharma Teaching. It means they are a certified Teacher, not a certified Buddha. There are Zen Master's who have achieved "Buddhahood" if you want to call it that, but Dharma Transmission does not certify them so. Always going on, Always BECOMING Buddha, Hail, Hail, Hail. It is possible for people to still get pulled off-center later in their training if they are not sitting deeply enough. That's why we take Refuge in the Sangha, as a checks and balance system against our own delusion. If we train with others, and start to indulge delusion subtly, if we train with others it's more likely someone will see it and point it out to us. It's not a guarantee, but it helps. It sounds like part of the issue here, is that you believe Dharma Transmission makes someone a Certified Budddha. It does not. And I have never heard anyone claim that it does so in my tradition. Dharma Transmission does not mean someone is completely free of greed, anger, and delusion. It means they know how to sit still with that greed, anger, and delusion and let it pass. And, people are human, and still occasionally get pulled off-center if they are not sitting deeply enough. Zen teachers are human beings friend. I would highly suggest talking to a monk or Monastic order and ask them directly what the purpose of Transmission is for. I'm sure they will be happy to help answer any questions. Explaining the Dharma is their livelihood after all. How do you get frustration, anger and misunderstanding from that??? You seem to be doing quite a bit of projecting here, Sara H.
Can we hope for at least average moral conduct? That's not asking too much is it? Sara H wrote: Dharma Transmission does not mean one has achieved "Buddhahood" it means they have had a kensho, (because having one is nessicary to understand the Dharma to teach it) and, it means they have undergone years of training, and education in Dharma and Dharma Teaching. This is the problem Sara: after authentic kensho people can make mistakes but not on the level discussed in this paper. It might be the case that someone had very shallow kensho but I still doubt that they could indulge in systematic manipulation which is what is discussed in this paper by two Zen teachers - one authentic and the German one probably not. Secondly morality spontaneously arises after kensho so even if one has violated morality in some minor way that realization is also always present. These moral lapses won't be major and focus on morality will be spontaneous. So I reject the assertion that after kensho a person is still a normal human being, Their Buddha Nature has been directly glimpsed or realized as a consequence of their personal kensho and so they are on a slightly different level, almost like a weak Stream Enterer in the Theravadin system (they have two different levels of Stream Entry) but with a bodhisattva focus. So more like a person basically at the end of the Path of Accumulation in the Tibetan system or very weakly at the level of Heat in the Path of Preparation (also in the Tibetan system). They are not Buddha's, that is true. Nonetheless they are not just ordinary beings if their kensho was real. I understand that, but even that transmission does not make that person a "super being". Where does the idea of "super being" come from, just from dharma transmission? I don't think so. It comes from people making stuff up about it. Does it say in the scriptures anywhere that one who received dharma transmission is now a "super being" who is to be put on a pedestal? I personally think the root cause is simply a misunderstanding of dharma transmission rather than dharma transmission itself. Who says dharma transmission equals anuttara samyak sambodhi? I've never read that in any scripture. Personally, I think whoever thinks dharma transmission equals anuttara samyak sambodhi, is simply being a fool. The answer is simple really, because the students were not being intelligent or reasonable, to begin with. A reasonable and intelligent student would have left those teachers behind in a heartbeat, without even thinking twice about it. There were soo many red flags it was ridiculous. Yes, dharma transmission does create a power structure. But, to blame the power structure for immoral behavior, I think misses the fact that the cause of the immoral behavior is not the power structure but the people involved. The teachers here are at fault obviously, but the students are also at fault here for not leaving such ridiculous circumstances. The students were being foolish by staying there. seeker242 wrote: I understand that, but even that transmission does not make that person a "super being". Where does the idea of "super being" come from, just from dharma transmission? Does the idea that a lineage master is necessarily a "super being" come from the Tibetan tradition? seeker242 wrote: I personally think the root cause is simply a misunderstanding of dharma transmission rather than dharma transmission itself. Who says dharma transmission equals anuttara samyak sambodhi? I've never read that in any scripture. Personally, I think whoever thinks dharma transmission equals anuttara samyak sambodhi, is simply being a fool. What do you think dharma transmission means? Do you also think it's like getting an college degree, like Sara H believes? It means a verification from another master of a certain level of understanding. It does not mean anuttara samyak sambodhi! shel wrote: Can we hope for at least average moral conduct? That's not asking too much is it? No, it's certainly not too much. However, what percentage of zen teachers engage in immoral conduct? What number would you guess? 1%, 2%, 10%, 20%. I would bet money the percentage is actually very, very low. Is it asking too much to expect perfect ethical behavior from every single teacher in all of existence? I think so. In fact, expecting that sounds pretty unreasonable. Unlike a PhD, that requires a whole institution with a faculty to earn it and has clear rules about the expectations, Dharma-transmission is given on a personal basis based on a single individual's assessment. So they are not very similar. Insight into the nature of mind has been interpreted as different levels of realisations by different teachers. For Mazu Daoyi, it is buddhahood right there. For Jinul it is the first stage of faith. And there are others in between, like 1st bhumi bodhisattva, or 8th bhumi bodhisattva. Nevertheless, it is meant to be the correct and direct realisation of things as they are, of suchness, emptiness, dependent origination, buddha-nature. If it is without clear consequences even to such basic things as ethical conduct, that attainment is meaningless. One of the definition of a sravaka stream-entrant is that it keeps the five precepts. While bodhisattva morals are little different, the awakening of bodhicitta includes unbound compassion towards all beings. Such compassion means that one has no intention to harm any being but to help them become free from all suffering. If you read the paper this topic has started with, you can see that such level of power abuse is far from compassionate conduct. And as for what interpretation we are talking about regarding Dharma-transmission, it is the general one among Zen followers who believe that Zen teachers are enlightened - just as you say too, that they have kensho - and therefore they are the living source of the Dharma and the judge of the student's realisation. That you don't connect this to ethical behaviour is another thing, since ethics come before meditation and wisdom. I understand that, but even that transmission does not make that person a "super being". Where does the idea of "super being" come from, just from dharma transmission? Don't you know all the stories of transmission, that the Buddha gave the True Dharma Eye to Kashyapa? Aren't you familiar with Zen stories of enlightened masters that are then used in meditation? One who receives transmission is counted as an heir to the Buddha and all the great patriarchs. And they emphasises this too, by for instance showing the whole lineage, talking about the importance of lineage, praising their own master and their master's master. The answer is simple really, because the students were not being intelligent or reasonable, to begin with. A reasonable and intelligent student would have left those teachers behind in a heartbeat, without even thinking twice about it. Not exactly. People who go to study under a teacher do that exactly because they don't know themselves what to do and expect the teacher to tell them. This is also pushed by the idea that you need and teacher and that you should obey your master. Being a student then is a little like being a child, where it doesn't really matter if you are intelligent or not. In fact, in Zen they like to say that one should put aside all cleverness, that Zen itself is beyond one's understanding. dharmagoat wrote: Does the idea that a lineage master is necessarily a "super being" come from the Tibetan tradition? Zen precedes the arrival of Buddhism to Tibet. Yes, I know the stories. But I have never hear any of them say dharma transmission equals anuttara samyak sambodhi. It's foolish to think that it does. Which zen scriptures say a student is required to have blind faith in a teacher and do whatever they say? Even if what they say and do is completely contrary to the precepts? That doesn't exist! You put aside cleverness, but you don't put aside reasonableness. For example, if a teacher shows up drunk to give a dharma talk, it's not "cleverness" to say "Hmm, there is something wrong with this guy." It's just being reasonable. When a person has genuine realisation of emptiness, the mental afflictions will be diminished and eventually eradicated totally. For those who claim that having realisations can still leave their mental afflictions intact, the most euphemistic way to describe that is their 'realisations' do not correspond to realisations according to the Buddha's teaching. The main point of the Dharma is to liberate us from attachment, aversion and ignorance. So if someone has realisation, these three poisons are destroyed or at least diminished to a large extent. seeker242 wrote: Which zen scriptures say a student is required to have blind faith in a teacher and do whatever they say? Even if what they say and do is completely contrary to the precepts? That doesn't exist! You put aside cleverness, but you don't put aside reasonableness. For example, if a teacher shows up drunk to give a dharma talk, it's not "cleverness" to say "Hmm, there is something wrong with this guy." It's just being reasonable. Maezumi Roshi, who is not discussed in the original paper, was an alcoholic, just to give you an example. 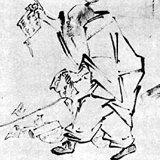 At the same time, we have Ko Bong's story as the "drunken master", or the entire life story of Ikkyu. It is not the point that scriptures don't say this, because people don't even read the sutras. The picture you have as your avatar is an example of the idea that in Zen the scriptures are not important, therefore the only form of authority that remains is the teacher. And that leaves the position of master in the special position of spiritual judge and even king over unenlightened students. Since Zen is not something unenlightened people can understand, whatever happens is beyond mortal comprehension. Does that level of understanding touch on moral conduct at all? If it does not then indeed, maybe Zen has no morals. Learned Audience, all Prajna comes from the Essence of Mind and not from an exterior source. So It is not that the scripture are not important. They can help you practice and a teacher can help you practice. It is that you aren't going to get Prajna from them and you aren't going to get Prajna from a teacher either. It comes out of one's own practice and only from there. No teacher can give someone the essence of zen. It is a mistake to think they can. You said "Since Zen is not something unenlightened people can understand", this is not correct zen teaching according to the tradition that I practice in, which is the Korean tradition. Teachers in my tradition say things like "Nothing that I can say can help you" and "you already understand". Stuff like that. I disagree with the whole premise of the paper. Obviously you do not. I think it would be appropriate to agree to disagree. What percentage of zen teachers that have received dharma transmission engage in moral misconduct? The author of the paper makes it appear as it it happens often. On what basis does he say it happen often? None, he's just making that up. What percentage of zen teachers that have received dharma transmission engage in moral misconduct? I guess a lot depends on what you consider moral misconduct. For instance, a Zen teacher might lie on occasion, but a student of this teacher might consider the lie 'expedient means' or something. Another recent example is the discussion about Jundo Cohen. He deliberately slanders others within Buddhism, not cultivating or encouraging respectful speech, despite having taken specific vows to not do this. The author of the paper makes it appear as it it happens often. On what basis does he say it happen often? Does he make it appear that it happens often or does he state that it happens often? I understood that the idea of lineage masters being in some way divine was not present in Zen, and that it belonged more with the Tibetan tradition. whose hell was not to see God. "